The stone night lights are handcrafted from Agate stone. 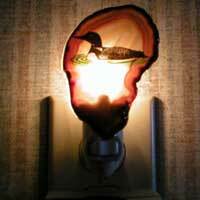 Available images on these Agate Stone Night Lights include Bear, Buck, Cardinal, Cat, Eagle, Horse, Hummingbird, Lighthouse, Loon, Moose, and a Plain Fancy Agate. The Agate Stone Night Lights is a beautiful accent to any room and measures approximately 4″ x 3″ x 2″. A stone night light is perfect for a housewarming or hostess gift.